Your roof is your home’s first line of defense when it comes to protecting you and your family from the elements. Well, it doesn’t do it on its own — it has a bit of help. If your roof is your main protector, your gutters are its sidekick. They work together with your roof to get rain and snow away from your home — and since they work together, that means your gutters affect your roof in a few major ways. If your gutters become loose from your fascia and start sagging in a certain area, water will pool there and continue to pull the gutter further down from your roof. Not only will that result in water running off your roof and straight down the side of your home, but the more they pull, the more those gutters can damage your fascia. When you first have your gutters installed, you should make sure they are properly sized to accommodate the water that will be running off your roof. The size of your roof has an effect on not only the size of your gutters but also the material they are made of. The wrong gutters can make for improper draining and future roof damage. If you don’t clean your gutters regularly enough, they can become clogged, and the water that flows into them will have nowhere else to go but back onto your roof. If too much water sits on your roof, it can seep under the shingles and cause water damage. What’s worse is that, if the pooling water becomes too heavy for your roof to support, holes can develop or your roof can cave in entirely! 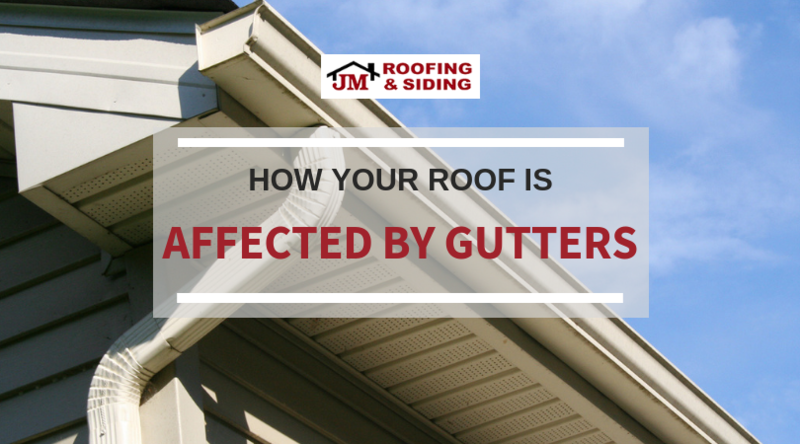 If gutter problems cause damage to your Norwalk roof, call the experts at JM Roofing and Siding for help. We can handle any issues that may arise with your roof at an affordable cost.